The Google Play Store App for Android has today been updated to version 4.0.25, bringing with it a completely redesigned UI and some new features. The Google Play Store 4.0.25 App is now available to download, utilising a new card-based featured which makes finding new content a lot easier, together with better looking icons and bigger pictures. The Google Play Store has long adopted a very dark look, and often made finding new content quite difficult and tough on the eyes in low-light. The new look Google Play Store 4.0.25 App seems to adopt the same card-based interface that Google Now utilises, offering the same ‘clean’ look that Google is trying to rollout across its products and services. Unfortunately the new Google Play Store 4.0.25 App isn’t something that you can download, so are forced to play the waiting game, but luckily the guys over at XDA have got the APK for you so as long as you have allowed Apps to be installed from unknown sources checked in the settings, simply hit up this link and install it. The new Google Play Store 4.0.25 App is absolutely fantastic and the new design is a welcome change, bringing minimalistic design to a place that really benefits from easy navigation, and pleasing colours. Whilst there is no specific mention of any new sections or mechanisms to make finding Apps any easier, the design alone seems to lend a hand in making the entire process a lot easier and more enjoyable. In case you missed it, here’s thelinkto download the APK once again. Let us know what you think of the new Google design in the comments section below. 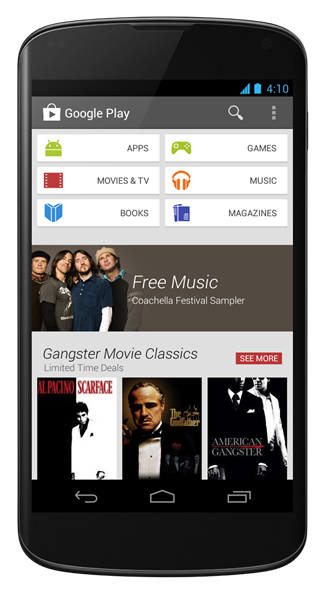 Did you prefer the old darker look of the store, or do you prefer the new cleaner brighter Google Play Store design?